A review copy of Super Motherload was provided by Roxley Games in exchange for a fair and honest review. I don’t get on especially well with deck builders, but Super Motherload is a notable exception. 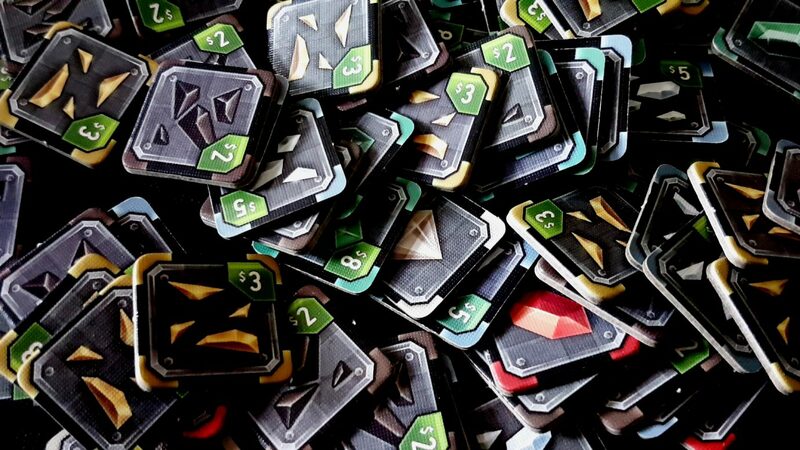 Somehow the designers have managed to create a game that is both simpler and smarter than most of the other ones we’ve looked at here on the blog. We gave the game four stars in our review and it represents one of the most approachable takes on this peculiarly popular system that we’ve seen. 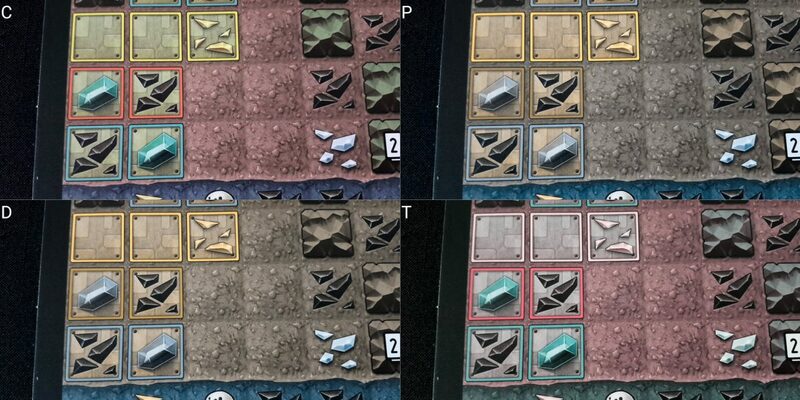 Whether it’s an accessible game though is still to be decided – let’s drill down into this unyielding bedrock and see what minerals, and mistakes, we might uncover. Drills are defined by their colour in one of four categories – red, yellow, blue and wild. The different drill colours can be distinguished, in good light, but there is a considerable degree of palette overlap in both the drills themselves and the background of the cards that serves as the largest colour source of differentiation. True, each card has a unique character associated with it and with time it’ll become second nature to know which is which – at least for familiar factions. That doesn’t change the fact that the palettes are not well designed to support those with colour blindness. The presence of a bomb pattern also helps to indicate the presence of red drills, but not to relate the colours of those drills to what’s on the board. This is particularly pronounced when comparing the yellow and red cards for those with Protanopia or Deuteranopia. As might be imagined this has an impact on the board too since steel vaults have colour coding that indicates what kind of drill must be spent to penetrate their interiors. This is a little bit clearer on the board than on the cards, and can be distinguished in most circumstances with close inspection and good lighting. However, taking in the state of the game board at a glance is going to be much more difficult if colour blindness must be considered. A player might spend their entire turn, and the downtime within the turns of other players, working out a plan that permits them access to all the resources contained within the vaulted areas. They spend their turn collecting up the cards that give them five yellow drills to be played in two separate actions. They play the first move and it’s fine, they get the extra card and the platinum. Then they attempt to play three yellow cards at the cross section only to find out they actually needed three red cards. Again, close inspection is enough to tell the difference in good lighting but you’ll often be looking at the board from a distance since it’s made up of two sections each of which will be peppered with colour information. A different border pattern and icon on the drills would have been good here, especially since that would also have underpinned the theme a bit better. What is the difference between red, blue and yellow? They could be fire, drills and lasers and that would show why some sections yield themselves to drilling styles that others don’t. Resources at least have their own unique graphical profiles to go with them. In any case they are distinguishable for all categories of colour blindness because the tokens come with dollar values. The scattered minerals that represent iron, gold and platinum are all well contrasted for all standard varieties of colour blindness short of monochromacy. 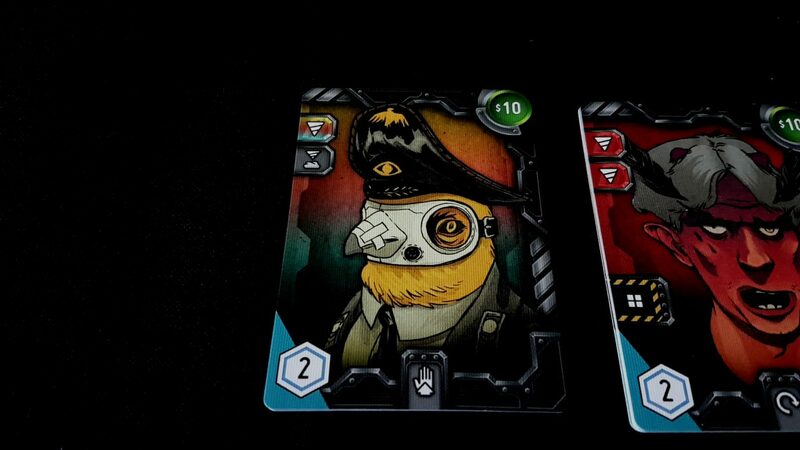 We don’t recommend Super Motherload in this category, but it is playable if you’re willing to risk the leaking of information and inconvenience that comes from having to closely inspect each vaulted area and cross reference it against your cards. The boards are information dense and aside from the tunnel sections which get placed on the board there are no tactile identifiers that would permit a player to work out game state by touch. The cards you use too are in a hidden hand and have no tactility to identify them. 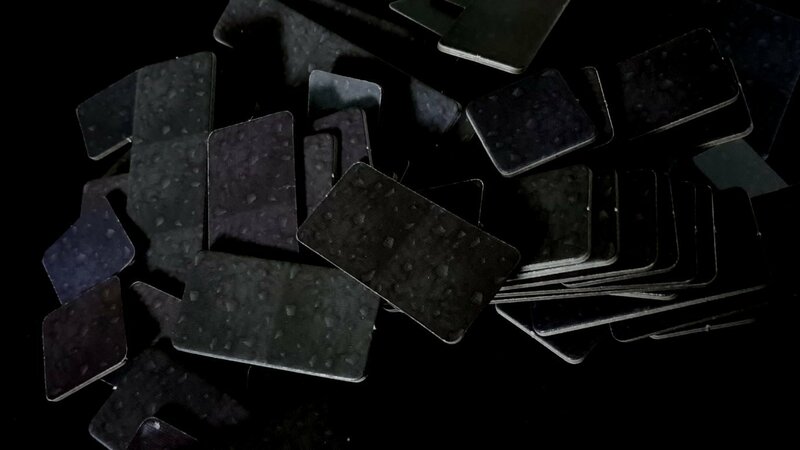 The resources you collect act as a kind of varied currency and again they all have the same tactile profile that makes it impossible to tell them apart – they’re double sided too which doesn’t help. We don’t recommend this game at all for those for whom total blindness must be considered. For those with less severe visual impairments there are still many important considerations. The board is very busy, with the visual clutter having considerable gameplay importance. This isn’t ornamental – it’s core to the game. Each square of the grid is differentiated by others with borders but these are poorly contrasted. Much of what you do is assess the strength of drilling you have against the board, and that becomes much harder to do if it’s not easy to see where squares begin and end – especially since tunnel tiles have no specific way to identify them by length. The cards in your hand are coherently structured, with information presented in a way that is well contrasted and all reliably distributed. Cost is always in the top right, drills in the top left, bomb patterns mid left, and so on. Close inspection of a card in hand might require the use of an assistive aid, but it’s feasible. Interestingly, the drill icons are presented with a degree of redundancy that offers an accessibility that multiplier signs would not. You don’t get red drills (x2) for example – you get two specific red drill icons. The alien artefacts you pick up have the same profile as the bombs, and they display secret information on the obverse that you likely don’t want to display to the table. The set of these is restricted, but it’s not exactly small. 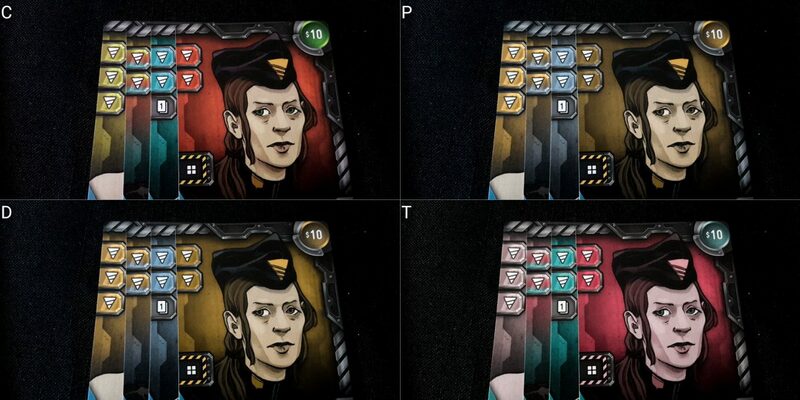 The icons will become identifiable as time goes by but you’ll spend a not inconsiderable amount of your first experiences with Super Motherload cross-referencing these, and the board, and the icons on your cards, against the descriptions in the manual. The largest problem though is in the basic game system which is going to involve mapping the cards you have in your hand against the opportunities presented by the board, which also has to take into account how much you’ve got distributed over your various cards. Since you’ll usually be working with two boards at a time, there is a lot of information you need to be ascertaining. Since you can only work from an existing tunnel though the possibility space is at least somewhat restricted. However, the choice of where you drill or where you bomb is about what options it opens up for you and your opponents as much as it is about what you get out of the action itself. That involves a lot of cross-referencing against your hand versus your draw deck versus the resources your opponents have on the various cards they’re working with. You can ask for support from the table in this regard, but the only reason you’d need to know how much they’re spending and where is to weigh up the relative value of the resources on the table. ‘How many red cards have you discarded?’ heavily implies that at some point you’ll be looking to do something where their red cards could be especially relevant. For those with moderate to severe visual impairments, the extent of visual information on the board means that we can’t offer a recommendation in this category although it is likely playable with effort. That effort will be considerable and we suspect to the detriment of the game experience. What we have here might be the first deck builder with a claim to being cognitively accessible, at least when dealing with the less severe spectrum of impairments. There is no emphasis on complex synergies of cards or upon deck curation. Card ratios and trigger effects are largely unimportant. There is no particularly correct way to build a deck to achieve a particular goal. All of the cards are useful, and even those with special abilities tend to have relatively straightforward impact. There are a few with more esoteric effects, but they tend to be limited to particular factions and in any case still don’t require any particularly deep thinking to execute upon. As such, most of the puzzle in Super Motherload is spatial, and the game itself helps you with that. You get tunnel tiles that you place over parts of the board, and the icons on each card permit a spatial comparison to tunnels that arithmetic by itself doesn’t easily facilitate. 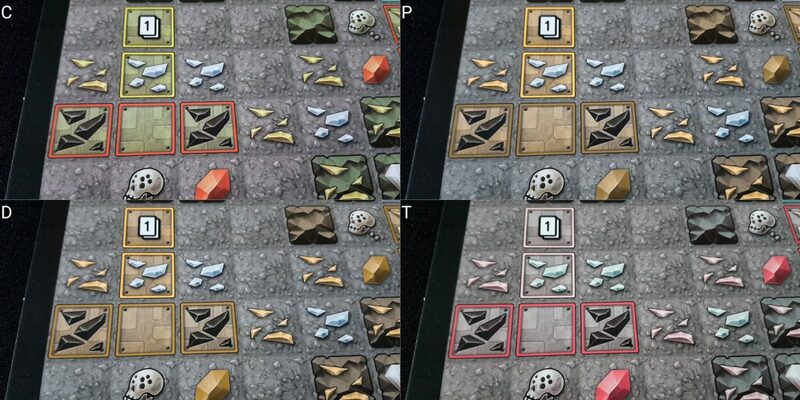 There are a few complexities of placement that might be awkward (rocks and steel) but in extreme circumstances those rules could be omitted and the game would still be interesting. Major achievements are based on card colours being purchased. Minor achievements require a degree of additional planning and execution upon plans. The minor achievement deck though can be curated to focus on the simpler of these with no real detriment. A degree of numeracy is required to handle the economy of cards, both in terms of meeting the face value and engineering the circumstances for underpayment. You don’t always want the most lucrative opportunities on the board. Making the most of the resources you have available sometimes requires a degree of specially engineering the circumstances and the order in which you end up purchasing the cards. Some of the miners as an example permit you to duplicate a resource that’s on an unpurchased miner. To get the most out of that means that you need to put something of value on a card and try not to buy it before you buy the other. There is a special miner that permits you to spread resources over multiple cards if he’s played as part of a drill action, and that in turn needs you to assess value in a way that isn’t simply arithmetic. Two diamonds may not be worth as much as three iron in such circumstances regardless of what the face values say. Some ability to navigate a flexibility of value is important in effective play. For those with memory impairments, all knowledge except for the secret information of individual players is represented in a way that permits interrogation – discard piles are face up, the board state is shared, and even the amount that has been paid towards cards is represented in a way that doesn’t require long term memorisation. Unusually for a deck builder, fine-grained knowledge of the composition of the draw deck you have is not necessary for play. This isn’t about arranging the circumstances for cards synergy such as we see in Star Realms. This is about having a deck that behaves well enough to take advantage of the board in front of you, and there’s almost always something you can do even if it’s not optimal. 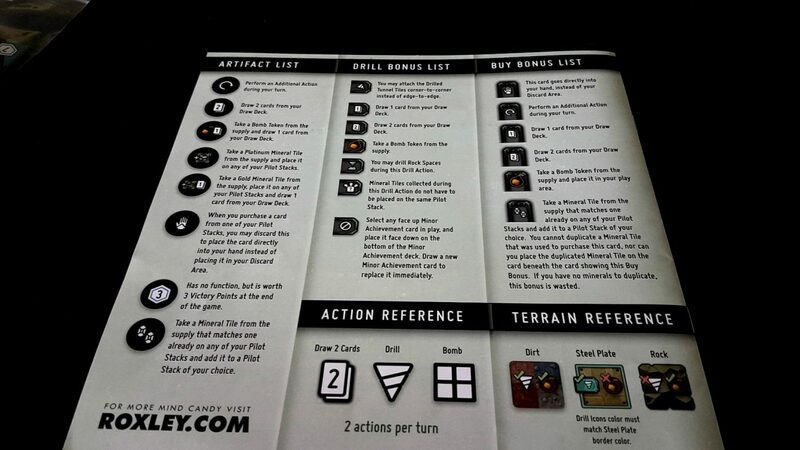 No literacy is required of play, although it may be necessary to refer to the icon guide in the manual relatively often at least in the beginning of play. Icons are descriptive in the main, but some of them are not immediately identifiable in terms of what they actually do. Familiarity will resolve this to an extent, although that is not necessarily a reliable indicator of accessibility in this category since familiarity building is itself a cognitively expensive process. The game state rarely becomes very complex, since deeper boards tend to mirror the shallow boards except in distribution of resources and obstacles. If a player can navigate the complexities of the first board, the others should present no challenge to understanding although they do need more sophisticated strategies for optimal drilling. There are no circumstances where the complexity will balloon in the ways we tend to see in games like Dominion. At most, a player may be given an extra action or two on their turn as a result of claimed artefacts or purchased cards. We’ll recommend Super Motherload in both categories of cognitive accessibility. In the fluid intelligence category our recommendation is only tentative though – we can be somewhat more enthusiastic about the game systems as far as memory is concerned. 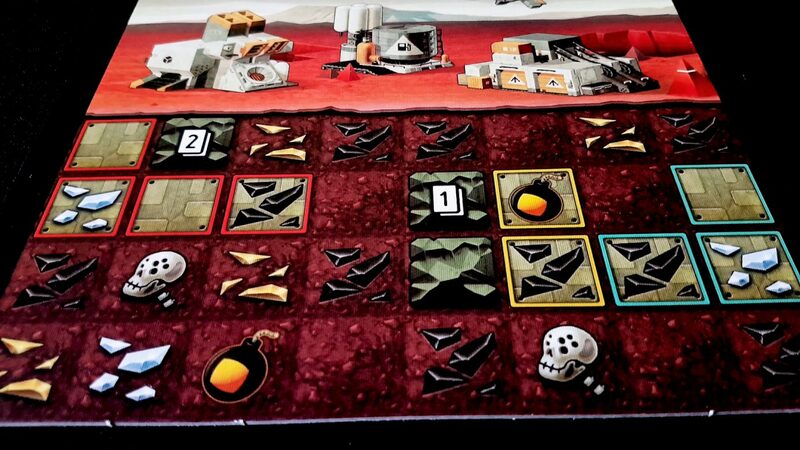 There is a certain minimum complexity expected of the rules in a game like this, but Super Motherload is as straightforward a game in this category as we could expect. The mechanics are deep, in every sense, but not overburdened by complication. There is no real player versus player interaction here. The most someone can do is beat you to a resource or achievement. While that may be galling, especially if it was because of an opportunity you set up, it is rarely all that problematic. The board is full of riches and as we’ve said many times already in the review and teardown – sometimes you don’t want the most expensive gems. Play in Super Motherload is largely frictionless – there’s enough in the mine shaft to reward everyone. Score disparities can be high (Mrs Meeple beat me in our last game by about 75-35) but that’s almost always because someone neglected the achievement cards in favour of mining ever more lucrative amounts of ore and gemstones. You know when someone is going for major achievements – it’s all about which cards have been purchased – and in the end if you don’t prioritise those it’s because you gambled on the victory points coming from elsewhere. You can win if you don’t get a single achievement but you need to relentlessly focus on card acquisition. The nature of the game involves blasting out resources from the landscape, and when the last artefact on a current board is collected the topmost board is removed and the next one is laid out. As such, this might have the effect of causing problems for those that feel the compulsive need for completion. You won’t mine everything out of a board before the next one comes out unless everyone makes a concentrated effort to make that happen. That’s certainly possible to do – the pace of play is set by the table. The tunnel system in Super Motherload though also adds an interesting ‘catch up’ mechanic to play – nobody owns a tunnel, which is one of the key reasons why players may want to wait for others to do the heavy lifting of mining before swooping in and claiming the reward. That means if you’re still working on the upper parts of the mineshaft you don’t need to worry about falling behind. You can mine the increasingly rich resources of the lower strata by doing nothing more than using tunnels other people have created. The openness of the board and the multiple paths to victory mean that ganging up is theoretically feasible, but functionally impossible. It’s hard to really imagine what a table might to do frustrate someone when every action they take just opens up more opportunities. There’s no specific resource that you can deny anyone, and no way to block their progress. There’s no trading at the table, and no way for players to meaningfully co-ordinate their activities in a way that advantages another except within very narrow constraints. That is, at best, very situational. While Super Motherload doesn’t permit opportunities to undo mistakes, it manages to dull the impact of that by making the legacy of mistakes both transient and easy to compensate for. If you miss out on an artefact, there will be more. If you missed a particularly lucrative gemstone, you can make up for it with a handful of lesser resources. We’ll strongly recommend Super Motherload in this category. The card mechanisms suffer from the same problem that we see in most deckbuilders – a lot of shuffling, and a lot of traffic of cards in hand. The pace of play is slightly slower here than you’ll see in something like Star Realms or Dominion, but the basic fact of its rhythm remains relevant. Unusually for a game like this you don’t get a fresh hand every turn – drawing cards is an explicit action and as such you won’t do it quite so often. When you’ve got your cards and are ready to play, most of what you do is cover up squares on the board with tunnel sections. This requires a considerable degree of precision since it’ll often be done within tight constraints on a highly interconnected board. If you nudge a single tunnel section you might end up redistributing the entirety of the board state into adjacent squares. You’ll only be dealing with two boards at a time so the impact is not necessarily impossible to undo. It’s a consideration though. 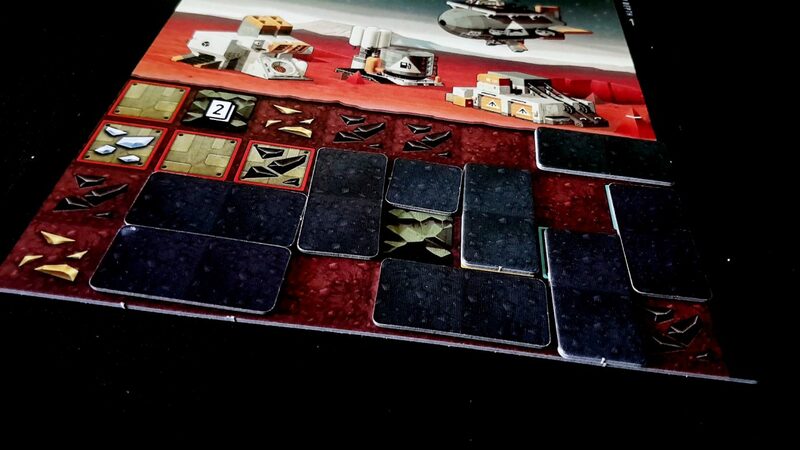 If Super Motherload had continued to add boards without cycling the earlier ones out it would be more of a problem, but they’ve gone for a much wiser approach here that constraints board sprawl to something more manageable. Don’t sneeze. Don’t even sneeze. Resources are double-sided, which can be a problem if there are issues of precise motor control – it’s easy to mistakenly flip a resource to its opposite side to either your benefit or detriment. You’ll have a wide variety of them displayed in front of you, and some of the game systems encourage you to spread them as far as possible in order to gain minor achievements or make use of card powers. None of this is necessarily a deal-breaker, but it has an impact. Verbalisation is not explicitly supported, because the only fixed identifier you have is shaft depth and in any case you’re just dealing with ‘top’ or ‘bottom’. As such, when you have a game state like that shown below it’s difficult to precisely explain what you want to happen, and where, and at what orientation. You could certainly rig up a row and column reference that permits this kind of thing, along with a convention for describing orientation. It would have been good though if the board itself had supported it especially since there’s so much unused space on the sides anyway. ‘Spend my first and third cards to place a three tunnel piece southwards at D6 on Depth 2’ would permit an unambiguous referencing that isn’t presented on the board. Make your own if necessary, because that represents the single real barrier to verbalisation here. We’ll recommend Super Motherload in this category, but only just. What problems exist can be worked around, and the ever-shifting nature of the boards has the effect of limiting the impact of some issues that are core to the design of play. The game requires no formal communication, and the level of literacy required will diminish as familiarity with the icons is built. In any case, a small crib sheet can offer full coverage of these. We’ll strongly recommend Super Motherload in this category. 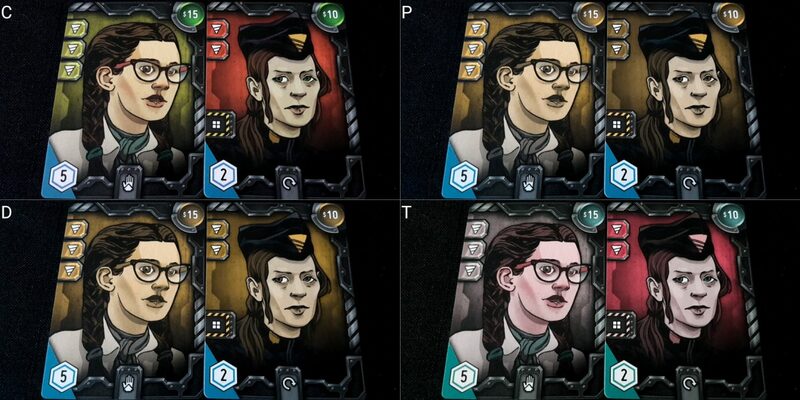 So, it’s a mixed bag – it would have been nice to take advantage of the unique art associated with other factions to show Mars is a place for everyone, but women at least are reasonably well represented. I wouldn’t want to comment too deeply on non-binary and genderfluid identities, but I think it’s also possible to see those reflected if you look. Whether that’s a quirk of the art, or an explicit choice, or simply projection on my part is a lot harder to say. The game has an RRP of around £40, which is a little on the steep side if what you’re looking for is a deck-builder that can continually excite and surprise you with its ingenuity. However, if what you’re looking for is a very solid and enjoyable game that eschews most of the complications associated with deck-builders it’s a good prospect. Still a little bit pricey but you do get a whole pile of boards and pieces in the box – you don’t find yourself wondering where your money went. We’ll recommend Super Motherload in this category. Primarily the accessibility issues in Super Motherload relate to the fact that there’s a lot of visual information, and while some if it is tactile it’s not tactile in a way that permits ease of decision making. There’s a relatively strong performance in every other category. The only intersection I can see likely to cause problems is if there’s a combination of physical impairment and a communicative impairment – the sophistication of the language required to indicate intent is likely to be quite large given the way in which information need be presented. However, if making use of a grid based system with orientation, it would be possible to handle this through exhaustive iteration through options – first through cards, then through a row and column intersection, then through all possible orientations. However, that would be immensely time consuming given each player has two actions they take on their turn and is likely to have a significantly deleterious effect on game flow. Super Motherload lasts a bit over an hour in my experience, although it gets a bit longer if players are indecisive about the choices they have available. It’s not quite long enough to be an obvious source of exacerbation of discomfort, and incorporates enough down-time that players can take ,pauses to deal with discomfort on an incremental basis. However, should that not be possible Super Motherload permits a degree of dropping out with house rules. There are very few resources on the board that are not duplicated, and no shared resources between factions other than bombs and artefacts. In terms of tokens, there are enough of these that recycling them is not necessary. Really all a player need do is stop taking their turns and while that will have an impact on the game it wouldn’t stop it continuing if the will is there for all other players. The only exception there is shifting from two players down to solo since the pace of the game is a property of the table and all challenge is extinguished when players can take as long as they like to play. When playing a two player game, the third depth of board is not used but if a late stage three player game becomes a two player game it wouldn’t have all that much impact since the earlier boards would have been mined competitively anyway. If a player drops out before the third depth is revealed, the game would smoothly enter into a two player game by simply going directly to the fourth board. Thus, while dropping out isn’t explicitly supported in the rules it is de facto a simple process to support. There are numerous changes that could be made to Super Motherload to improve its accessibility profile, but overall the nature of the game means that we can be broadly positive about it in most of our categories. The issues of colour blindness would be a relatively easy fix, but there are more substantive problems when it comes to visual accessibility. There’s just too much information represented visually, and with too much of a possibility space to parse, that it’s hard to see what could be done beyond a few surface fixes. Notches in tunnel tiles and different profiles for resources and artefacts would help. In the end though the problem is that this is a game of spatially explicit visual parsing and there’s only so accessible that could ever be. 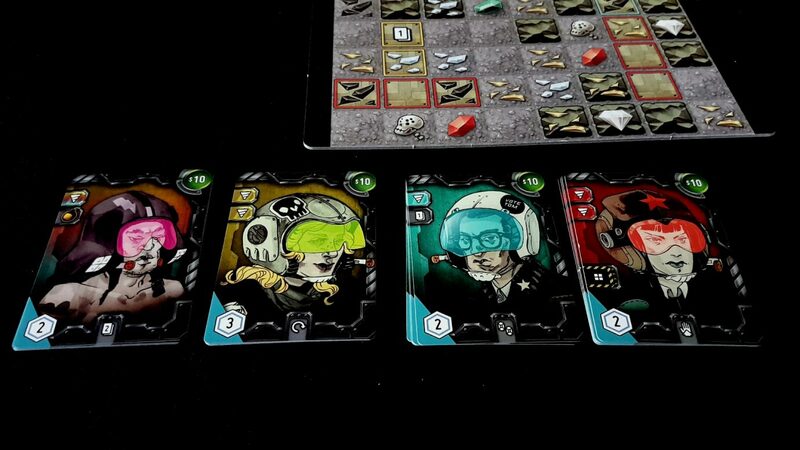 We gave Super Motherload four stars in our review – it’s a deck-builder that becomes smarter as a result of its simplicity. While we couldn’t recommend it to those with visual accessibility issues, it actually makes a reasonably strong candidate for almost everyone else. 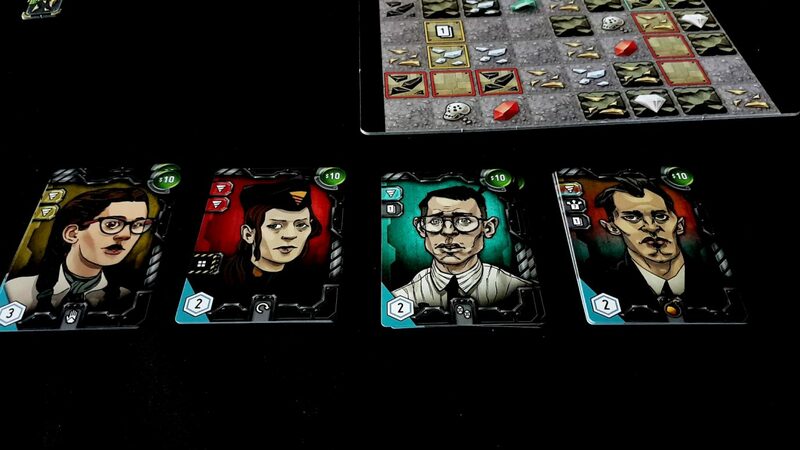 As usual, all recommendations are provided replete with caveats and provisos, but if it seems from our discussion that you might be able to play we’d certainly suggest you consider giving it a go.